Ask yourself: How do you advocate for literacy in your sphere of influence? A couple of years ago, a few CADL youth librarians decided to form the Building Readers initiative to reach children from infancy to five years old through community partners. We started with doctor’s offices. As a librarian, one of the things I lament is knowing there are children who may not have a home environment where regular reading is practiced and valued. Those children tend not to be regular patrons in libraries and sometimes struggle with literacy as they grow. 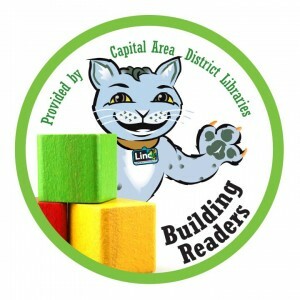 The mission of the Building Readers initiative is to advance Capital Area District Libraries’ role as a literacy advocate by working with medical professionals and community organizations to provide a foundation of success for children up to five years old. Our goal is always to encourage parents and caregivers to read aloud with their children. Research repeatedly shows children who succeed in reading means reading aloud is common in their home. So, what is it we do with doctor’s offices? First, we buy books. LOTS of them! Through grant monies and community partnerships CADL has purchased and delivered almost 2,500 books to health provider offices like Cedar Pediatrics and Mason Pediatrics. During well-child visits children up to five years old receive a book and an enthusiastic message from a health provider about the importance of reading and participating in early literacy activities. Additionally, CADL collects used children’s books to distribute in waiting rooms for children of all ages interested in taking a book home. 1. Read aloud with your child daily. If you don’t have children, perhaps there are children you could help by offering to read to them. 2. Check out Reach Out and Read. This organization is the model we used to begin our Building Readers initiative. We are grateful for the Reach and Read model and advice from other library systems who are doing like-minded outreach. 3. Advocate for literacy and strong reading habits for all children. Start in your family and move on to communities you are a part of. For more information about Building Readers contact CADL Youth Services Specialist Mari Garza at garzam@cadl.org. Well-child visits occur often during the first 5 years of a child’s life. Each visit includes a complete physical exam. Info from the MedlinePlus online encyclopedia managed by the U.S. National Library of Medicine.